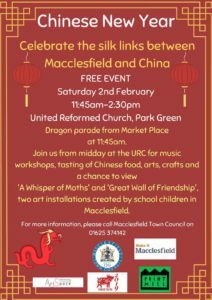 We are organising (in partnership with Macclesfield Community Artspace), an event in Macclesfield for Chinese New Year. It will take place on Saturday 2nd February. MMC are looking to provide some percussion instruments for the Parade, for children to play as they walk. Previous article:Interested in becoming a Trustee?